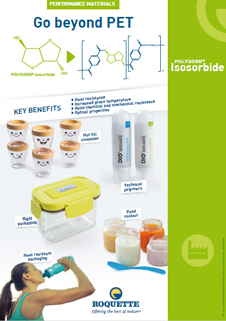 POLYSORB® PSA by Roquette Isosorbide is a highly pure isosorbide grade available in the form of white pellets. Offers excellent optical properties (low birefringence & excellent light transmission), and high surface resistance. Provides good chemical- & UV resistance, and scratch resistance. It can also be used in the form of plasticizer. 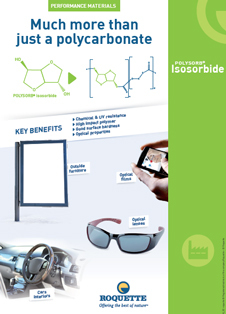 POLYSORB® PSA is compatible with polycarbonates. Please note, these HSP values are estimations. It is based upon the “like seeks like” principle. It splits an ingredients interactions into three parameters; δD (Dispersion force interactions), δP (Polar forces interactions) and δH (Hydrogen bond force interactions). Hansen Solubility Parameters can help you find a wide range of products that are predicted to be compatible with POLYSORB® PSA. A practical determination of these HSP values would provide higher certainty. Learn More.